Our news and events will be published on this page. 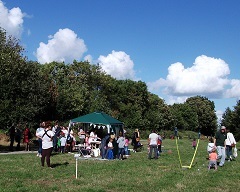 Events are held in the park on the second Sunday or each month. 15th May 2018 Good Gym volunteers dug out the pond for us. 13th May 2018 A concentrated effort at the school exit triangle, cleared weeds from the flowers and trees. 27th January 2018 Wassail - A cold day and joined by Creative Croydon and the Wild Hunt Morris Dancers. 8th April 2018 First work day following the snow. 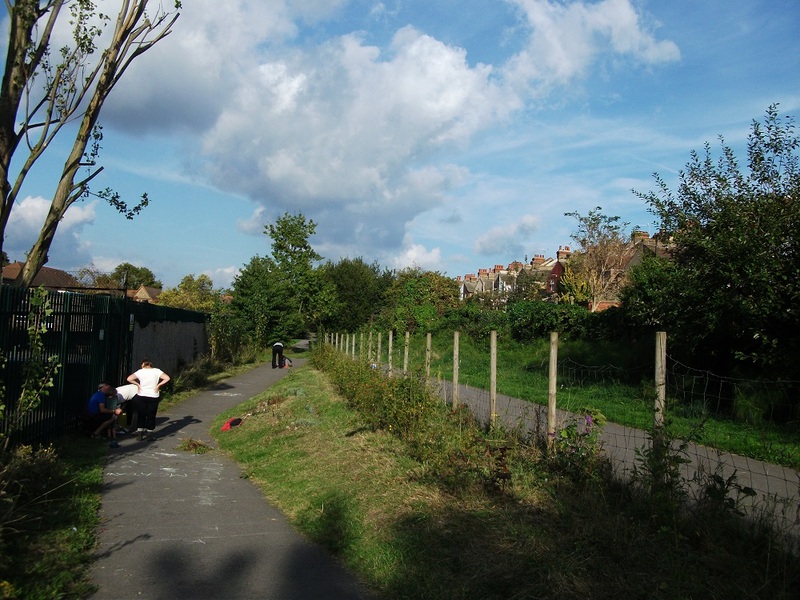 We planted seeds and cleared rubbish from the Blackhorse Lane end of the park. Our March events was cancelled due to late snow. 12th February 2018 Work started near the bridge to clear undergrowth and trees ready for inspection by an engineer. 11th February 2018 A busy day, 3 bird bozes placed on trees, brambles removed at orchard, compost around orchard trees and cherry trees planted. 14th January 2018 A Dry cool day resulted in a lot being done, 20 trees planted, litter picking throughout the park and several raised beds were weeded ready for the spring vegetable planting. Four scouts and their leaders also joined us. 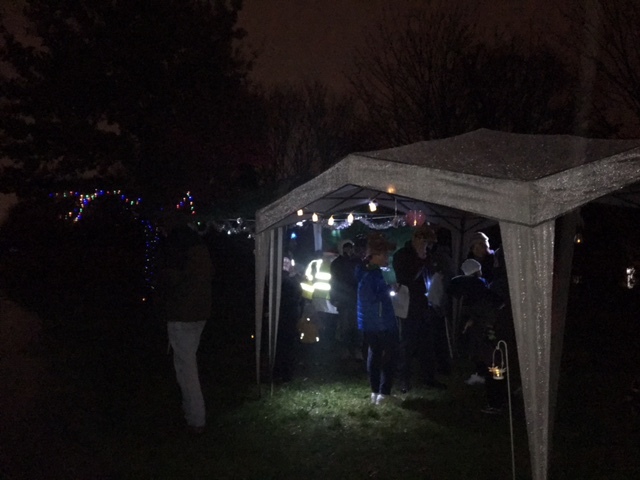 16th December 2017 Carol Singing in the park attracted around 30 people on a cold rainy night. 10th December 2017 The 28th Croydon Scouts joined us again in the park on a cold snowy day and helped to plant 7 silver birch trees. 12th November 2017 Work started in the Community Garden, weeding the planters and generally tidying up. 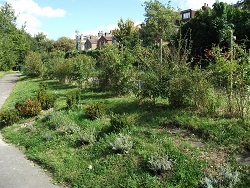 Bulbs and trees were planted in the park, and brambles were cleared near the school ready for tree planting. 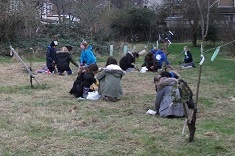 The 28th Croydon Scouts joined us, to work towards their Environmental badge. 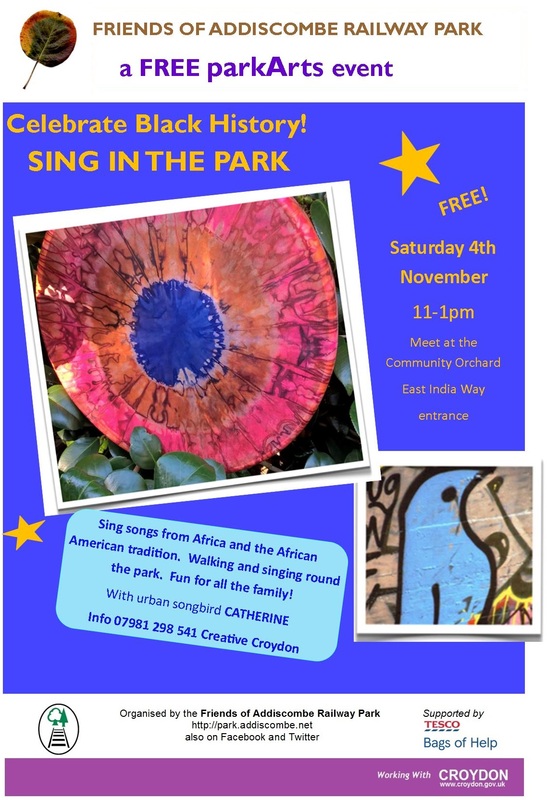 4th November 2017 Our singing event was cancelled due to poor weather conditions. 28th October 2017 We held a Halloween event in the northern half of the park. It was attended by over 200 people. 8th October 2017 We cleared the brambles around the silver birch copse beside the orchard. 24th September 2017 Our 2nd Apply Day was held near the Community Garden. 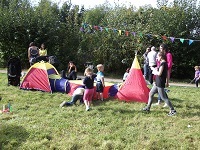 Many new outdoor games were available to keep the children amused. See photos. 10th September 2017 We concentrated again on the school exit triangle, to tidy the undergrowth and cleared areas around young trees planted nearby. See photos. 13th August 2017 We concentrated again on the school exit triangle, to complete the planting of the lavender, geraniums and shrubs. 1st August 2017 The Good Gym volunteers arrived in the park to help with cleaning up and tidying the park. 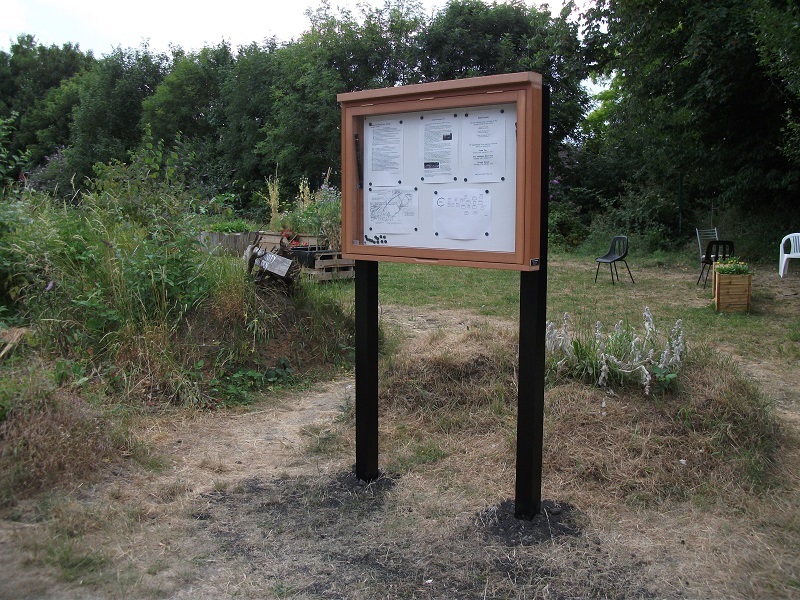 22nd June 2017 Our noticeboard was installed at the Community Garden entrance. 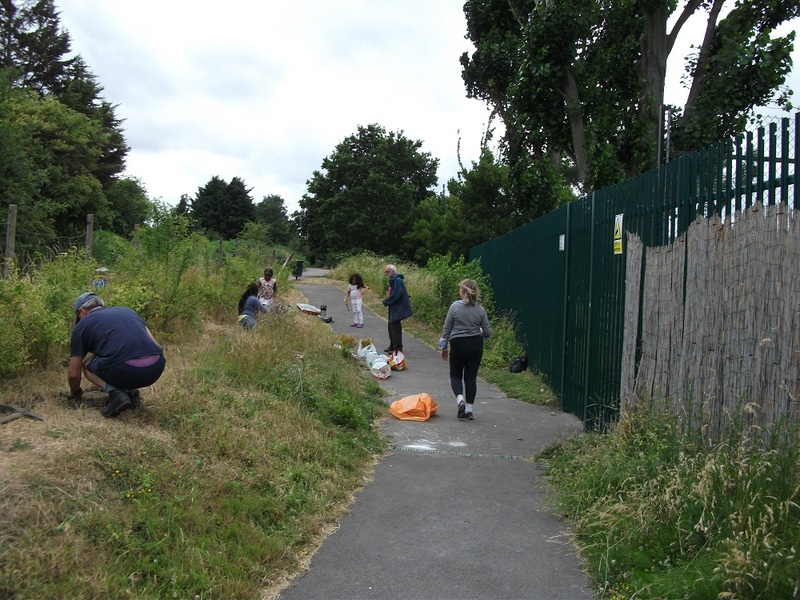 9th June 2017 We concentrated again on the clearing brambles and undergrowth from the young trees around the school exit triangle, school wall and the water area. We also prepared a few holes in the triangle in which to plant Lavender. 14th May 2017 13 Volunteers concentrated their attention on the clearing brambles and undergrowth from the young trees, the school exit triangle, school wall and the water area. 2nd May 201710 people from 'Good Gym' joined us in the Community Garden and filled 4 new raised beds with compost. 9th April 2017 Nearly everybody helped around the Community Garden. A new low flower bed was created for the wild flowers from the Kew Gardens, Grow Wild project. 12th March 2017 The work day was rather drizly and work was mostly grass cutting in the Graden area and replcing the protection around the young trees near the school. 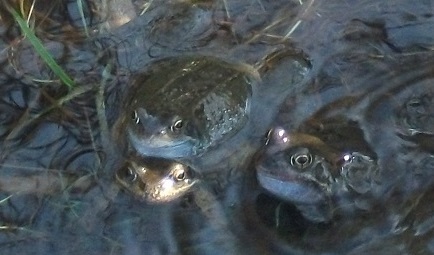 Frogs already spawning. 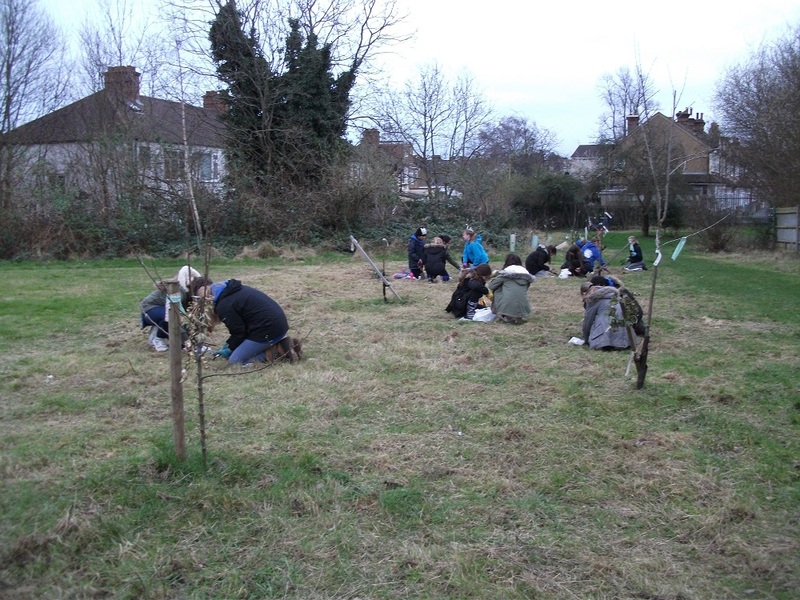 8th March 2017 Girl Guides planted 300 bulbs between the trees in the Orchard. 12th February 2017 We planted 50 young trees around the park. 28th January 2017 We held our 2nd Wassail. Weather was dry and not too cold. Over 60 people attended and watched the morris dancers. See the event photographs photographs. 13th January 2017 Several members met at the orchard to learn about pruning the orchard tries. Snow was on the ground and still falling at the time. 8th January 2017 We met at the Community Garden widing the access for whell chairs and prams. 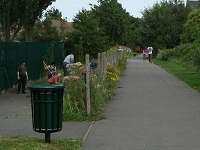 Then moved to the school access triangle and tidied the area, weeding and pruning. 11th December 2016 The Community Garden was our main area of work again. 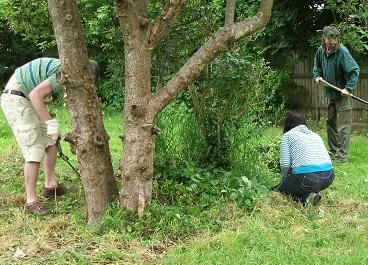 Tidying the budlea and brambles in the Community Garden and cutting off dead branches at the orchard. 13th November 2016 The Community Garden was our main area of work. 3 additional crates have been added for use as planting containers next year. 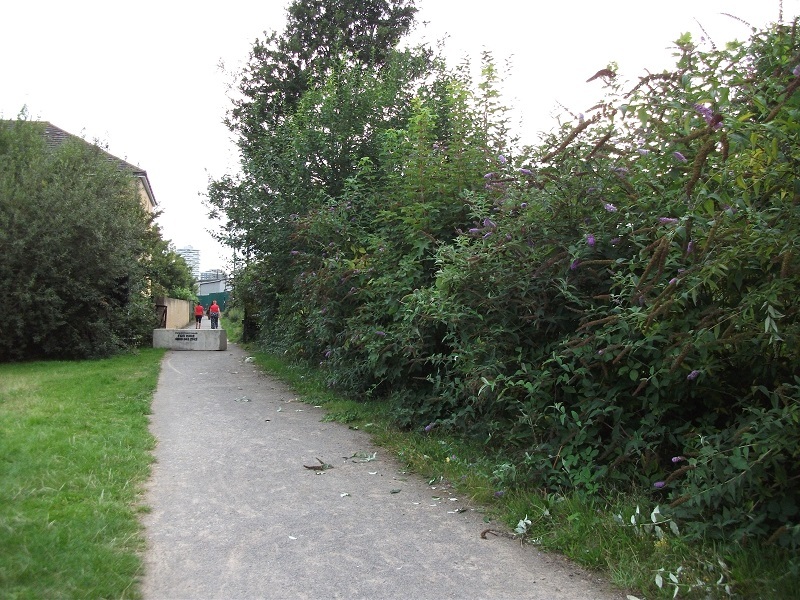 9th October 2016 We concentrated on the removal of brambles along the school wall opposite the water area, and removed growth and litter from the water. 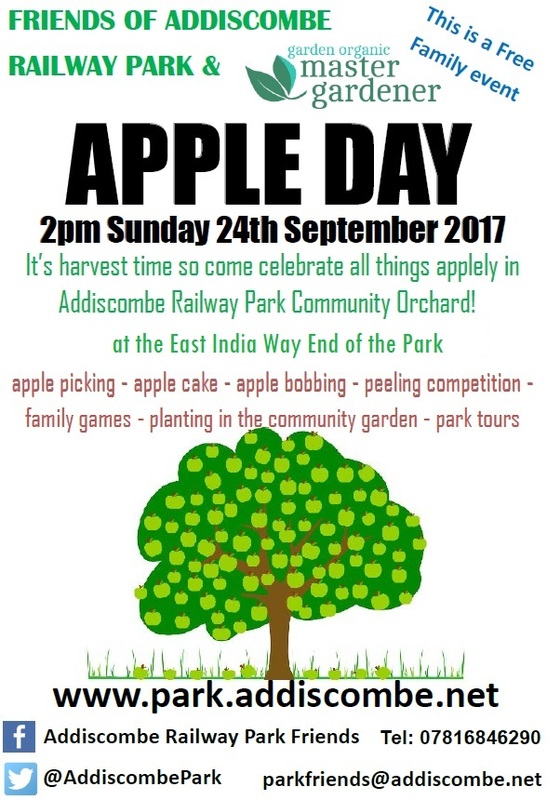 25th September 2016 we held an apple day event to encourage visitors to use the park and introduce them to the Community Garden and the Orchard. A large number of people attended, you can view some of the photographs taken on the event page. 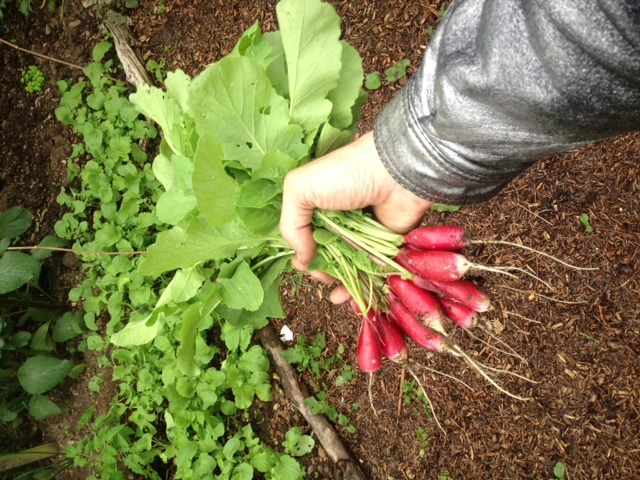 All out work days from June to September have concentrated on the Community Garden and Orchard areas. All of the orchard trees survived the long hot summer, and all had a small amount of fruit. April 2016 and May 2016 work days mainly concentrated on planting bulbs and preparation for the Community garden project. See before and after. 13th March 2016 We counted at least 20 frogs in the water area. 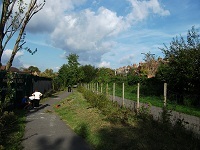 Brambles were cleared along the school wall and water course. Litter picking was also completed across the whole park. See the event page for photographs. 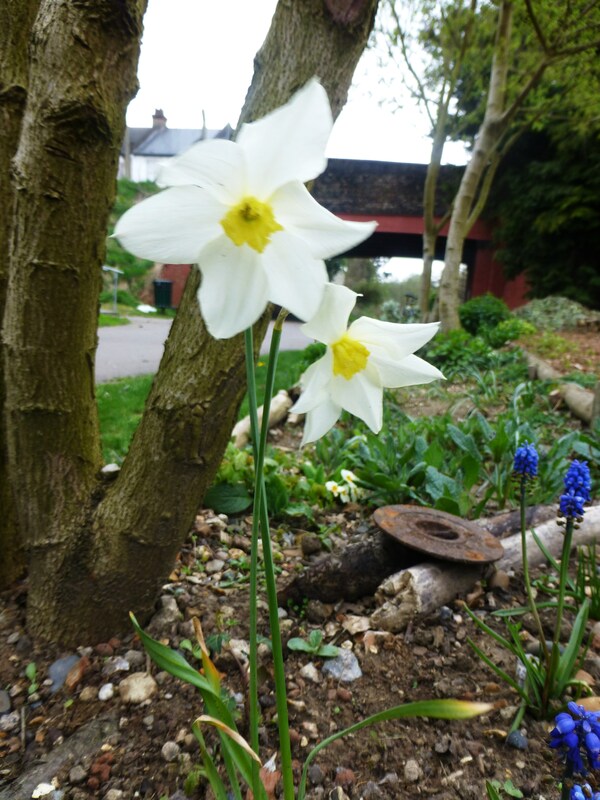 14th February 2016 we prepared a raised safron bed at the East India Way end of the park and planted more daffodil bulbs around the park. 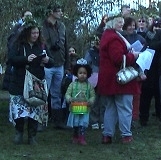 Saturday 30th January 2016 Our Wassail day went well. Up to 70 people attended along with the Mayor of Croydon. You can see some of the photographs of this event. 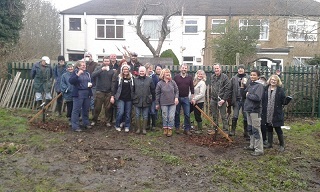 10th January 2016 We Planted 12 trees to create an Orchard. See the event page for photographs. August to December we battled the brambles and prepared for the planting of an Orchard. See the event page for photographs. 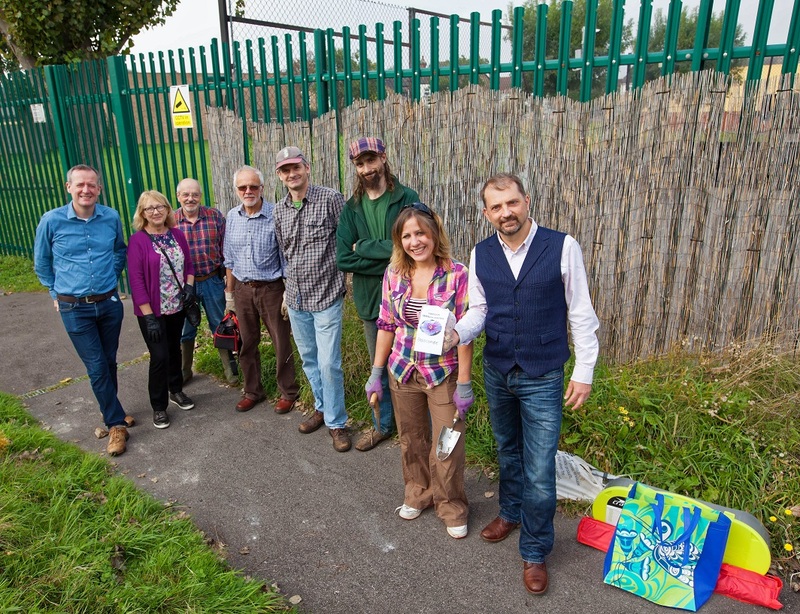 3rd October 2015 We planted crocus bulbs and an apple tree with the help of Red Cross refugees and Councillors. 12th July 2015 was a busy day with numerous tasks undertaken. See photographs. 7th June 2015 This was the National Big Lunch day. 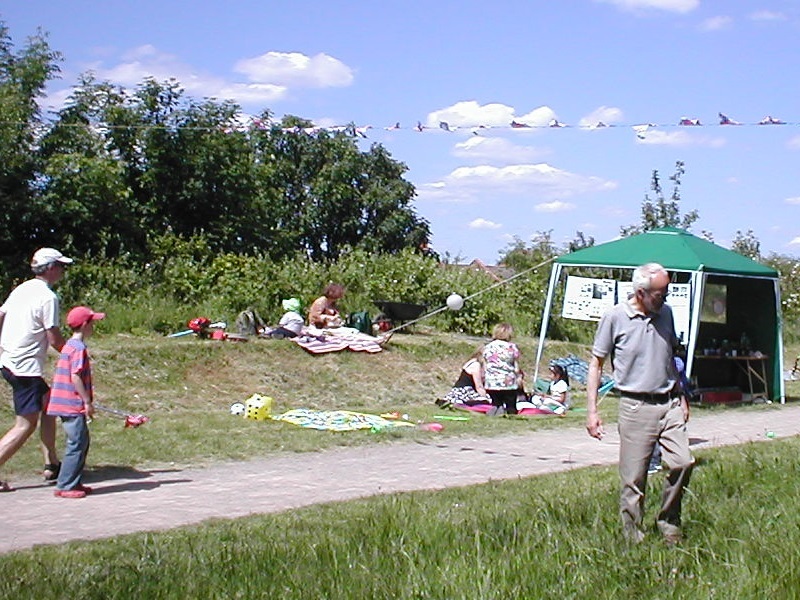 The group held a picnic in the park attended by local families. 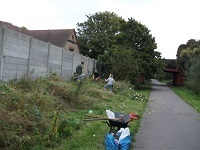 12th April 2015 and 10th May 2015 continued the work of clearing away the brambles and creeping plants along the school wall and opposite the school entrance. 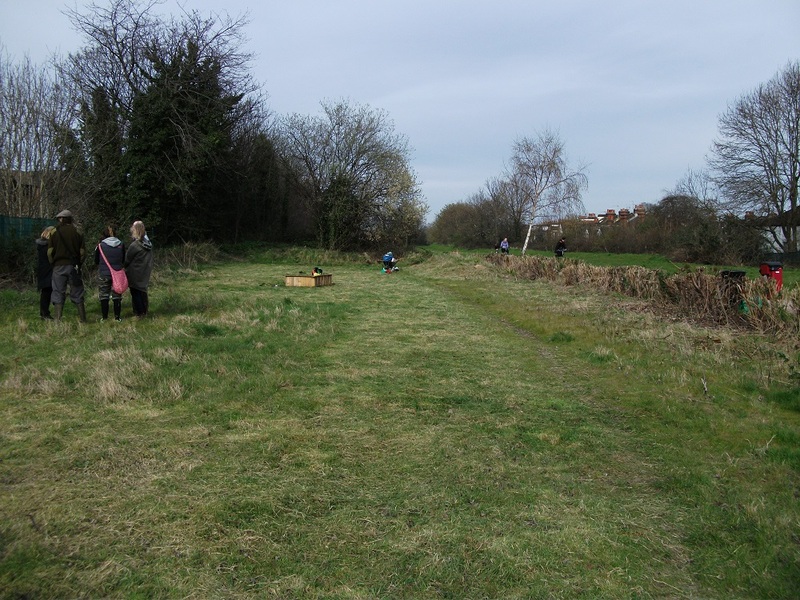 8th March 2015 We cut back the brambles and creeping plants along the school wall, put up a bird box at the south end of the park and planted a Pear tree. A new page was added to the Heritage section of the web site. It shows a video of one of the last train journeys between Woodside Station and Addiscombe Station. 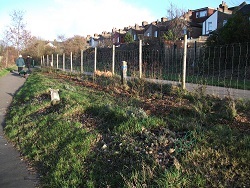 11th January 2015 and 8th February 2015 we cut back the brambles and creeping plants opposite the school exit triangle in preparation for planting several Oak trees. 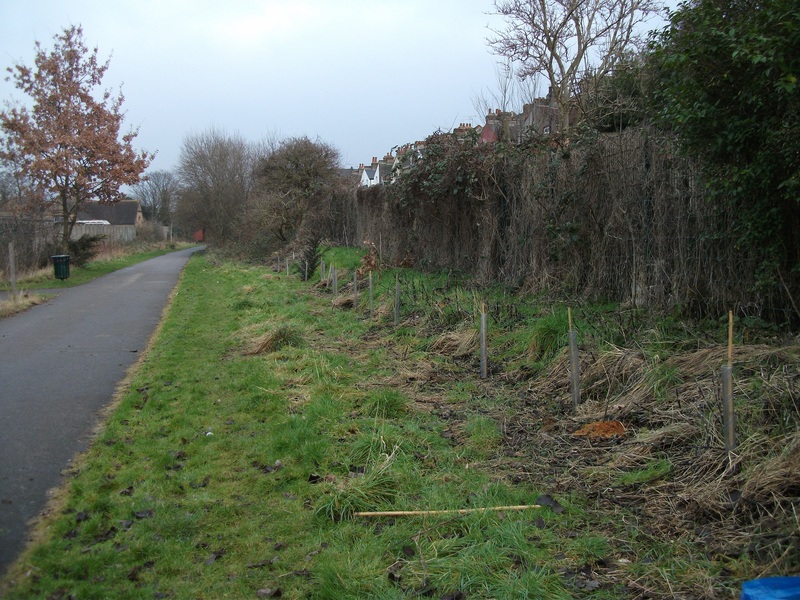 9th November 2014 we cut back the nettles and brambles behind the water course. 12th October 2014 we removed the brambles from the school wall which had grown more than 2 metres high. No young trees appear to have survived in this area of the park. 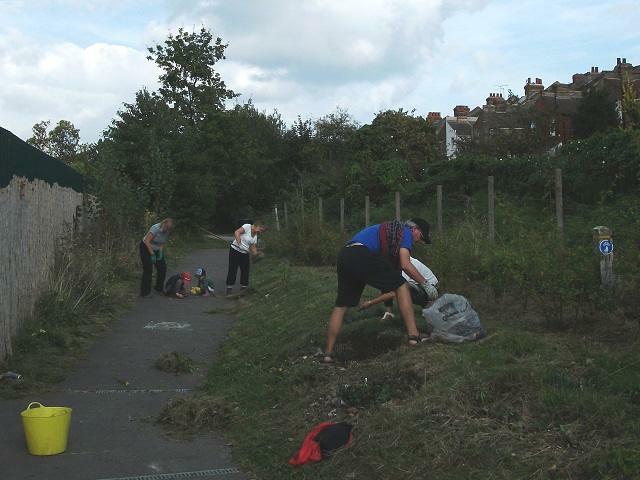 14th September 2014 we tidied up the triangle area near the school exit gate. Work days up to 8th June 2014 concentrated on keeping the horsetail and weeds down to protect the young trees. 9th March 2014 we cut back the brambles along the path at the northern end of the park. and strimmed the grass around the young trees by the school wall. 9th February 2014 work day we spread 18 bags of wood chippings around the young trees on the school exit triangle. 12th January 2014 was rather wet so we just litter picked the whole park removing 6 bags or litter. 8th December 2013 Work day we planted around 30 young trees. 10th November 2013 We Litter picked the park, and worked on the water course, widening and deeping the ditch area. 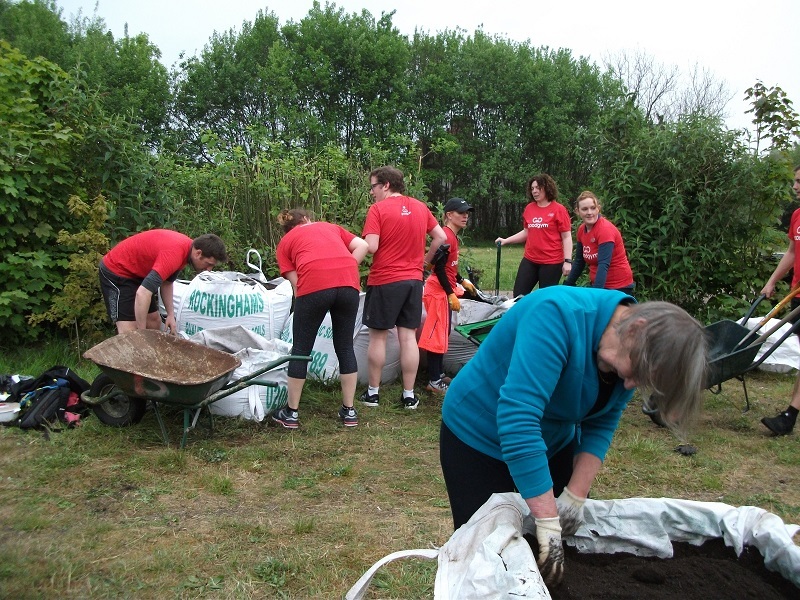 8th September 2013 We weeded around the school triangle, but had to stop early due to rain. 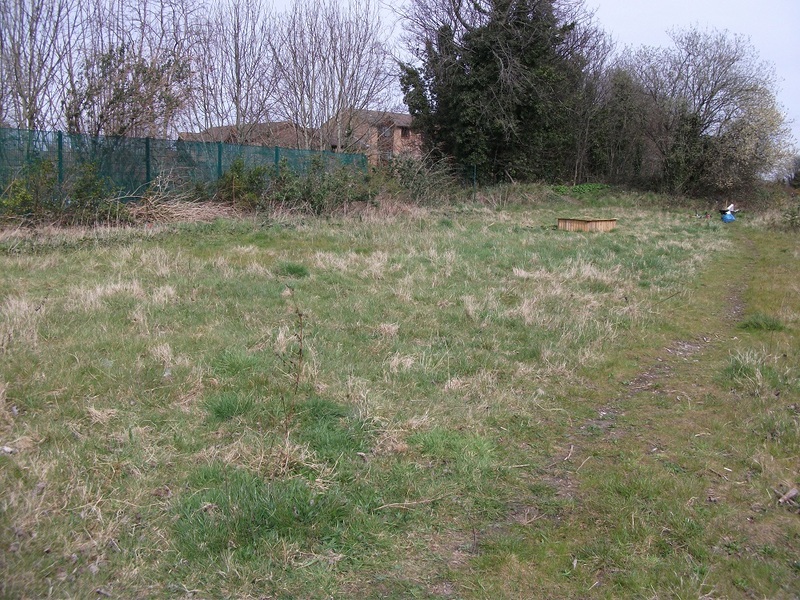 The allotment page has been explanded to include further pictures of the allotment. 11th August 2013 We weeded around the water course area and jubilee trees and watered the new trees. A new page was added for news about the allotment. 14th July 2013 the weather was very hot. We cut back the weeds and undrgrowth around the young trees and watered them. 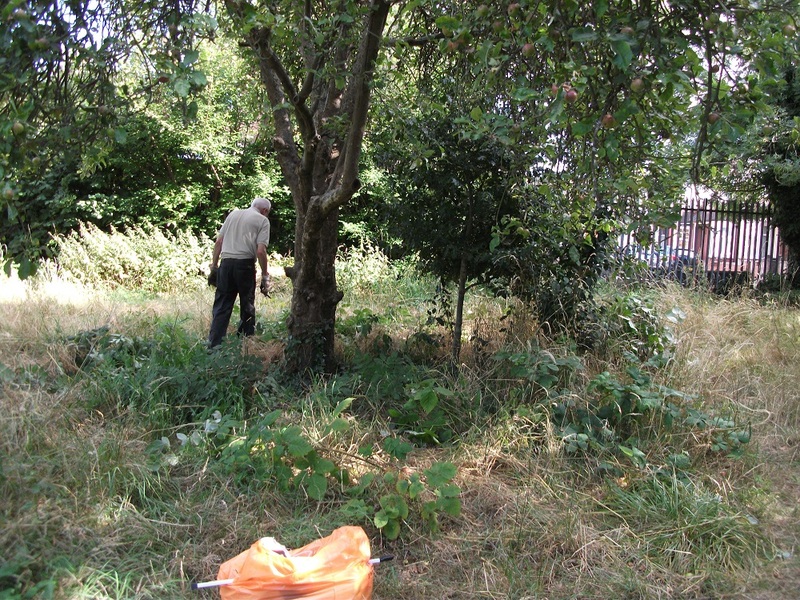 9th June 2013 we weeded around the young trees and watered them. 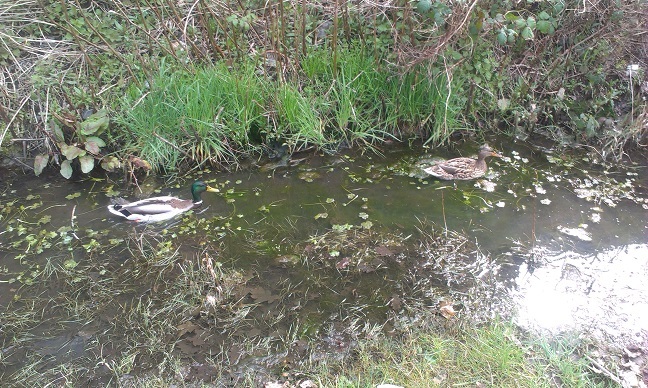 12th May 2013 we undertook a big clean-up operation removing 13 bags of rubbish from the park, and weeded around the water course area. 3rd May 2013 The children from Woodside school planted trees in the park on 3rd May 2013. They have done a wonderful job planting trees around the Apple tree enclosure at the Southern end of the park. 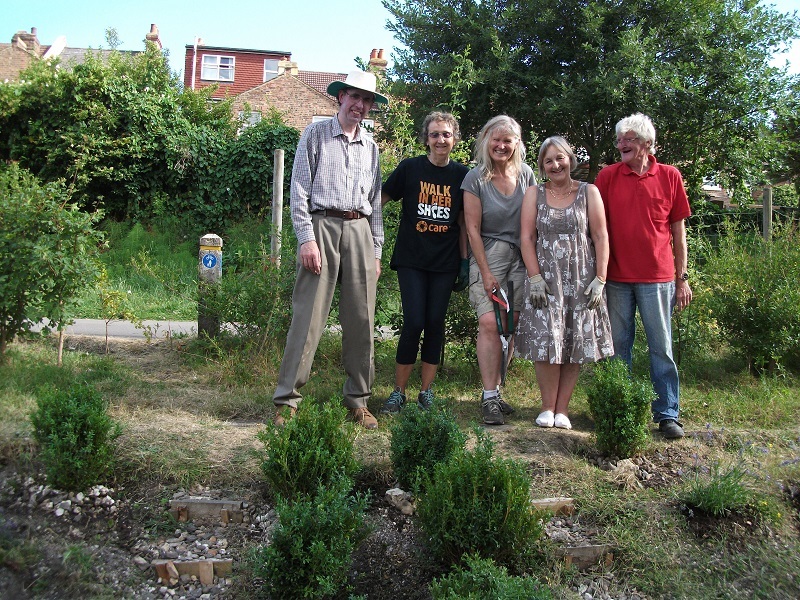 Jonathon and friends have been busy tidying up the allotment area at the end of North end of the park. They have also been planting bulbs. See Photos. 14th April 2013 we were completing work around the apple tree enclosure ready for the planting of trees and shrubs. The weather was a lot better. Jonathan and friends continued work at the bridge end of the park. 17th March 2013 we were working around the apple tree enclosure again preparing planting areas for trees and shrubs. It was wet and cold. Jonathan and friends continued work at the bridge end of the park. 10th February 2013 we were working around the apple tree enclosure preparing planting areas for trees and shrubs. It was wet, muddy but not too cold, and good progress was made. Work will be completed on the March work day. 9th December 2012this work day saw further work on the water course. We cleared the rushes that had died back and continued widening and deepening the ditch area. 11th November 2012 - Further work was undertaken on the water course, and wood chippings were spread around the jubilee trees. 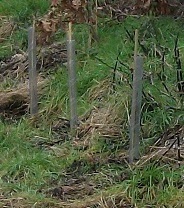 Foxgloves were also planted in selected areas. 14th October 2012 - A concentrated effort on the water course has prepared it for the winter months, making it a little deeper for the frogs to hibernate in, and will help with drainage following rainfall. 9th September 2012 - Work around the young trees was continued to help keep them free from ivy and tall weeds. 12th August 2012 August had a lot of changeable weather, but saw a large group of volunteers turn out to help with the trees and school triangle. A large number of young newts were also observed in the water course. 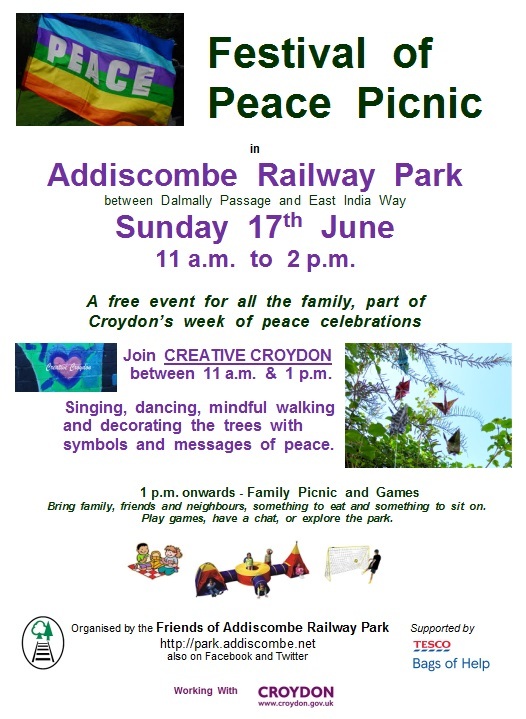 July 2012 A local ground organised a walkabout in Addiscombe that involved a stroll through the park. The allotment was of particular interest. June and July were both wet, and the undergrowth grew so fast it smothered all our previous work. 28th July 2012 - The AGM was held in the Baptist Church Hall. 10th June 2012 & 8th July 2012 - Attention concentrated on weeding around the School wall trees and triangle area. 1st June 2012 - The Queens Diamond Jubilee was marked by the children form Woodside School drawing commemorative patterns and messages on the Park pathway. 13th May 2012 - The Coal Yard was subject to a lot of attention, cutting back over hanging branches, clearing stones and filling deep holes. 15th April 2012 - General tasks were completed around the park including seeding the water course. 9th December 2012 - The work day saw further work on the water course. We cleared the rushes that had died back and continued widening and deepening the ditch area. 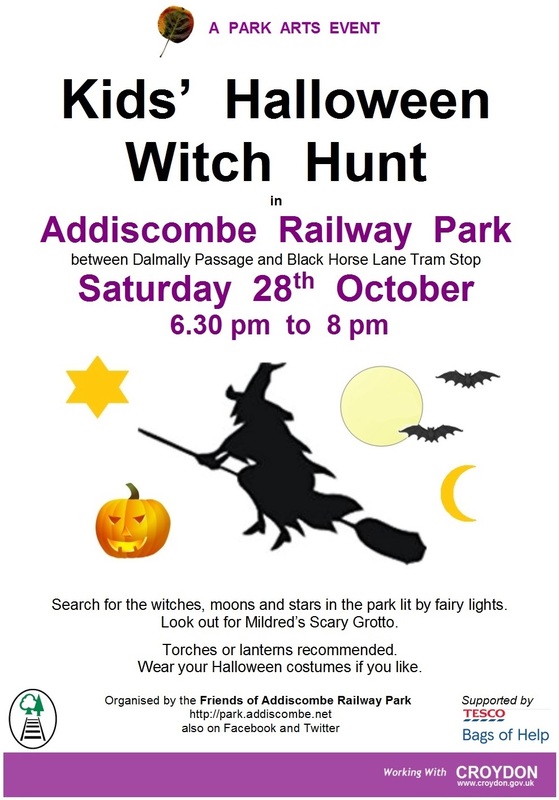 A walk about of the Addiscombe area saw a group of local residents visit the park. 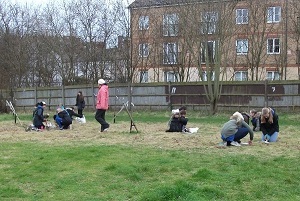 15th April 2012 - Events & News page updated following a general tidy up and seeding in the park. 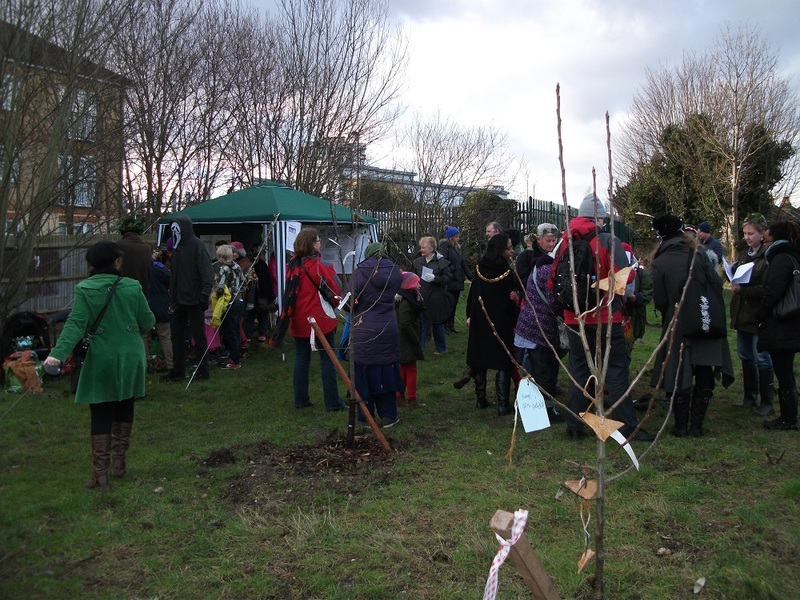 22nd March 2012 - Events & News page updated following the planting of trees for Diamond Jubilee. 11th March 2012 - Events & News page updated following work to prepare the area near the school for the children to plant Diamond Jubilee Trees. 8th January 2012 - Events & News page updated following work around the water feature area. 13th December 2011 - Events & News page updated following work to the water feature area. 19th November 2011 - Events, News, Trees, and Insects pages updated and new Fungi page added. 13th November 2011 - Some of the fallen trees were cleared and placed in log piles to help wildlife. 29th October 2011 - The group seeded two selected areas with wild flower seeds and planted bulbs. 23rd October 2011 - The trees and bushes page has been updated with a photograph of the latest tree to fruit and the events page has been updated too. 13th September 2011 - A Halloween page has been added to the childrens section. 10th September 2011 - Group meeting held. 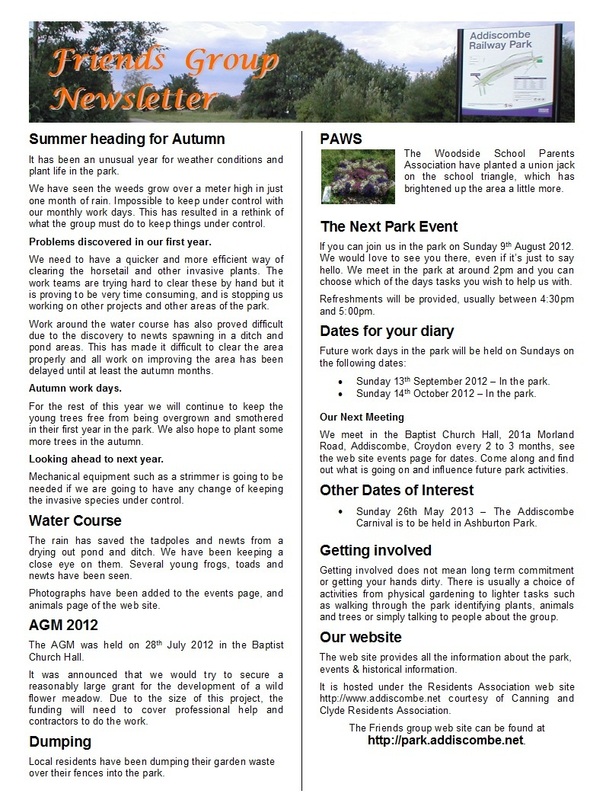 25th August 2011 - A suggestions page has been added to the web site showing comments and suggestions by local residents. 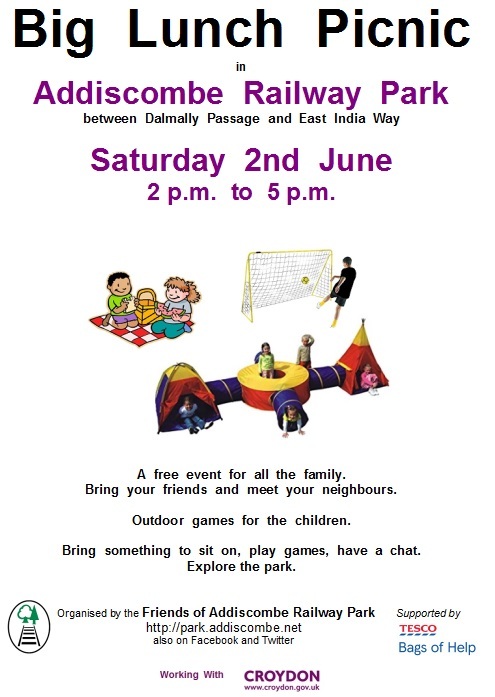 21st August 2011 - Our first public event was held in the park. 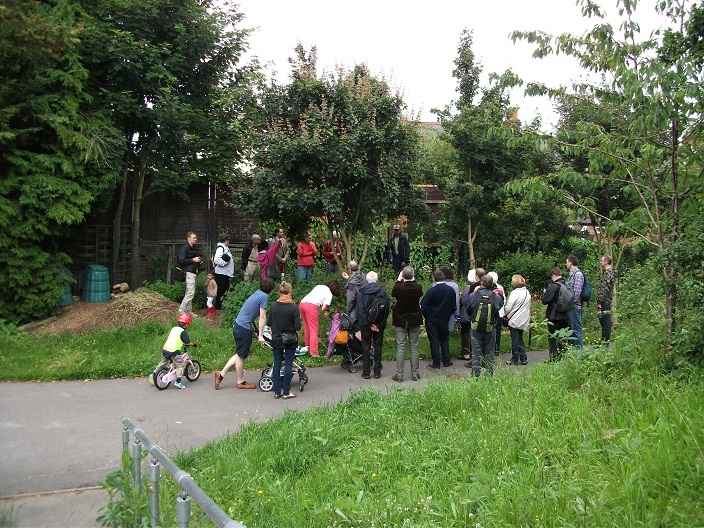 13th August 2011 - A walk through the park by local residents on their way to the South Norwood Country Park. 12th August 2011 - An Insects page has been added for photographs of insects. 6th August 2011 - A butterfly and moths page has been added for butterfly photographs. 6th August 2011 - A trees and bushes page has been added to include flowering and seeding trees. 6th August 2011 - The flower pages have been updated to include flowers in August. 27th July 2011 - Heritage pages expanded to include an extended Timeline and photographic pages 1 2 3. 9th July 2011 - Members met to decide on a Chairperson, Secretary and Treasurer for details see the Committee page. The groups constitution was accepted. 2nd July 2011 - Members met to discuss a draft constitution, current and future works. 1st July 2011 - Pages added to help people identify common british birds that are likely to be seen in their garden or in the country side. See Page 1 and Page 2.